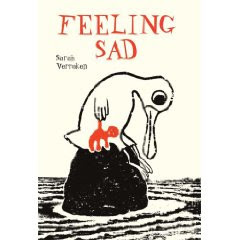 Feeling Sad by Sarah Verroken. Enchanted Lion. Enchanted Lion Books. 2009. Copy supplied by Publisher. Publisher's Fall 2009 Catalog. Poor Duck. "Everything around her seems so gloomy." The only color in her world comes from her toy, Cuddly. Everything else is black and white. She is "grumpy and sad," and so is her world. Slowly, as her mood lifts, color returns to her world. I love the drawings; woodcuts, that slowly, slowly introduce color. I love that the text doesn't point out the gradual introduction of color; it's for the reader to notice. When I first picked up on it, sure enough, I was actually a few pages behind. On one level, it's about a gloomy Duck. And Duck sees only a gloomy world. And of course it's about what the title says: Feeling Sad. When we feel sad, we see things one way; as our mood changes and brightens, how we see thing change, and it can be a slow process. On another level, it's not just sadness -- it's also depression. And kids can be extreme in their emotions; high highs and low lows. And they see it in others. So a book that shows that -- that reflects that reality? Especially that sometimes people (and Ducks) just feel sad for no reason? And does it without being all obviously bibliotherapy about it? Good. Plus, I really really like the illustrations. Enchanted Lions is a small publisher; and I'm consistently impressed with the artistry of their picture books. Seriously, sometimes I just want to cut pictures out of their books and frame them. Links: Author's blog. Which is in English and Dutch. Because the author is bilingual. How cool is that? Sometimes people feel sad for no reason? YES! I love a book that allows a kid to feel that whatever feeling they have is okay. I'll bet Mr. Rogers would have loved this one.